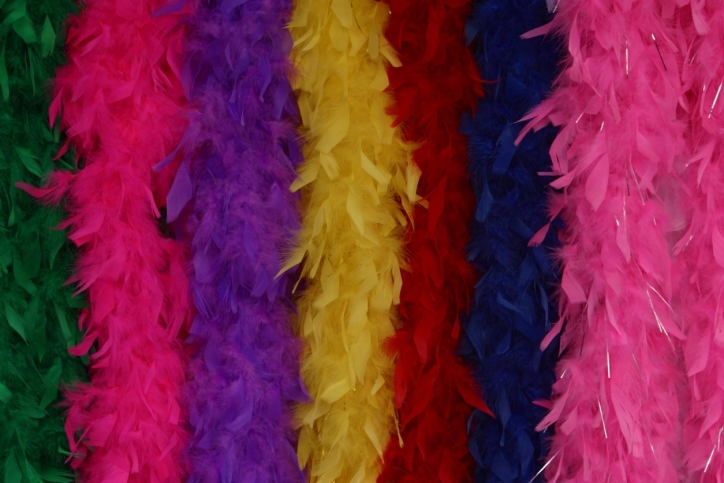 What color is your feather boa? Seriously, are you in the habit of wearing color in your clothing or accessories on a daily basis? If not, you are missing out on one aspect of your image where you could be making the most impact. Color is the first thing people notice about you: the color of your eyes, hair and skin – naturally – but also the color of your clothing and accessories. Color makes the first visual impression on others before anything else. Are the colors you are wearing supporting you? If you are in the habit of wearing black on a daily basis, you have likely stopped noticing how color looks on you. If you were more in tuned to the impact of color against your skin, you would notice black drains color from your face and leaves an overall ‘cold’ appearance. If you have a closet full of black, I challenge you to acquire colorful accessories like necklaces, earrings and scarves to bring color around your face and brighten your visual image. Black is serious, authoritative and unapproachable. Is that the impression you wish to make on others? Most people would like to appear friendly, interesting and youthful. The best way to create this impression on others is to wear colors that support your natural body coloring by enhancing your skin tone, eyes and hair. The end result is a visually balanced, harmonious work of art. You are the work of art! If you are unsure about your best colors or simply wish to confirm your intuition, I am professionally trained in personalized color analysis. The system I use is not a seasonal color system. I do not believe a person can be placed into one of four categories. There is no one else like you in the entire universe; therefore, the system I use is designed to render a unique, personal fan of colors that is one of a kind. If you would like to color your world, contact me at 469.363.0193 for special summer pricing on personalized color analysis! It’s time to show the world just how fabulous you are in your best colors. Men, this includes you. My system is designed for men and women, so don’t be shy. Next Who Cares? / Why Not?